These harmful algal blooms not only impact aquatic ecosystems and animals, but also the people that recreate on these coastal waterways. Located on the Caloosahatchee River close to where the river meets the Gulf of Mexico, Edison Sailing Center had to shut down for nearly eight weeks in response to the algal blooms, which made sailing an unsafe activity. “We have operated, continuously, since 1983. This is the first time – other than two hurricanes – that we have had to close our doors” stated Stephanie Webb, one of the founders of the Fort Myers-based sailing center. Harmful algal blooms, also known as HABs, occur when colonies of algae that live in fresh or saltwater grow out of control and produce toxic or harmful effects on people and aquatic wildlife. Some algae produce toxins that can kill fish, mammals and birds and may cause illnesses in humans. Other algae are nontoxic, but when they bloom may use up all of the oxygen in the water, smother corals, aquatic vegetation and wildlife, discolor and even contaminate drinking water. When these events occur, they are collectively called harmful algal blooms. What is the green slime? 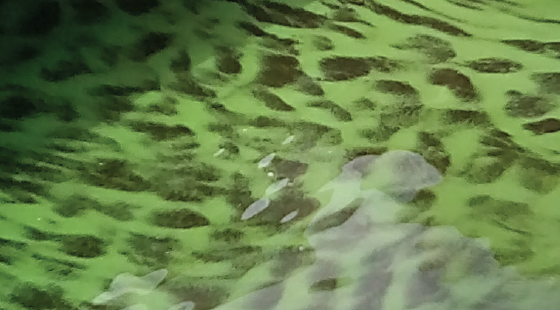 Resembling pea soup, the blue-green algae blooms are caused by freshwater cyanobacteria, which are commonly found in Florida’s lakes, rivers and estuaries. Under favorable environmental conditions, they can grow and accumulate forming blooms. Although there are many drivers that cause blue-green algae blooms to form, research has shown that these freshwater blooms are influenced by excess nutrients, such as fertilizers and sewage, entering waterways. Blue-green algae blooms negatively impact aquatic ecosystems by blocking sunlight to submerged vegetation and reducing oxygen available to other aquatic organisms. Additionally, toxins produced by cyanobacteria can be harmful to humans and aquatic life. The red tide poisoning thousands of fish, birds, sea turtles and marine mammals along the coast of Florida is caused by a dinoflagellate (a type of marine microorganism) called Karenia brevis. This species of algae produces brevetoxins, which can affect the central nervous system of fish and other vertebrates. These potent toxins can kill marine life, make shellfish toxic to eat and can cause respiratory irritation in humans if the toxin becomes airborne. Florida red tides develop 10-40 miles offshore away from human influence and naturally occur under ideal environmental conditions. However, research suggests once the blooms move inshore, the algae can use both human-contributed and natural nutrients. Since K. brevis cannot tolerate low-salinity waters, the blooms generally remain in marine coastal waters. As a boater, what can you do? 1. Report when you see indications of a harmful algal bloom, including seeing dead or distressed wildlife, experiencing respiratory or skin irritations or seeing discolored water. 2. If possible, use a holding tank to store sewage until it can be transferred ashore at a pumpout station. If you are in an area without pumpout facilities, be sure you are more than three miles offshore before you discharge your blackwater. 3. Instead of washing your boat with cleaning products, try doing a water-only washdown with some extra elbow grease. 4. 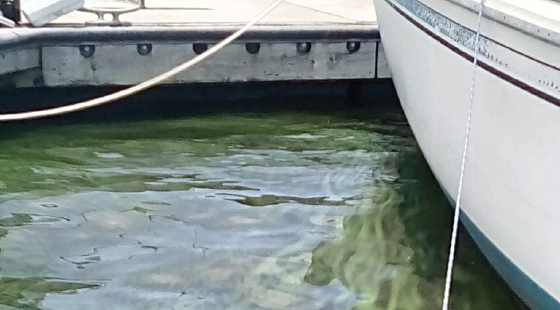 Avoid damaging seagrass beds with your engine and anchor in shallow waters. Seagrasses help filter nutrients that come from land-based sources. 5. If you live along the coast, include native plants in your landscape as these plants require minimal fertilizer, pesticides and water to be maintained. 6. Support research to continue to track and better understand the drivers of red tide and other harmful algal blooms, and to determine if there are ways to control or mitigate HABs.